Optoma HD25 review | What Hi-Fi? Unveiled earlier in the year, the Optoma HD25 certainly impresses on paper. Adding to the firm’s range of DLP projectors, the new HD25 boasts Full HD resolution, 3D, a built-in 10W speaker, two HDMI inputs, a pair of 3D glasses and a backlit remote. But does it deliver on performance? It certainly does: starting off with 2D images, the HD25 is confident and comfortable, displaying a well-balanced picture that’s pleasant to watch. 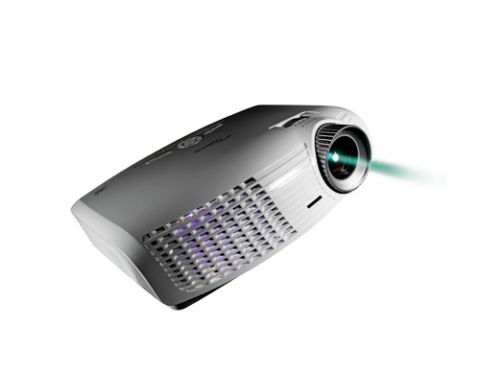 There’s great clarity, with no noticeable noise across the screen – remarkable for an £800 projector. The HD25 reproduces colour with an eager touch, just short of being too enthusiastic or overblown. Delve into the ‘Image’ settings in the HD25’s menu and make sure you set the Colour Temperature to ‘Medium’ rather than ‘Warm’ – it delivers a more natural palette. Ignore 2012’s terribly uninspiring reboot of Total Recall remake, and focus instead on the stunning visuals: the grimy dystopian underworld with glowing neon lights juxtaposed with the white, clean lines of the upper-city buildings makes for a great Blu-ray test – and the HD25 holds its own. There’s enough detail on offer to convey different textures confidently; the dirt and grime is as tangible as the glass and metal. In absolute terms it could do with a splash of subtlety to give it more depth – rivals such as the Epson EH-TW5910 dig deeper and are a more immersive viewing experience thanks to superior detail levels. Black levels in the Optoma aren’t handled as well as some competitors either – while the contrast of the grey buildings and blinking yellow lights looks great, some darker patches can get muddled up, with edges not being as sharply defined or detailed enough to be differentiated. The HD25 may not go as deep into the blacks, but it does perform favourably when it comes to shadow definition. In terms of sound performance the Optoma HD25’s built-in 10W speakers sound punchy in comparison to its rivals at this price level. When it comes to motion, the Optoma HD25 is a smooth experience. While not perfect, there’s nothing obvious to distract us from enjoying the movie, whether Blu-ray, DVD or 3D. And speaking of 3D, Optoma includes a pair of active 3D glasses and an RF emitter with Knight Rider-like lights. Motion in 3D is still a bit shaky, with hints of judder and layering, and it will prove wearisome to watch over a long period of time. Setting up the HD25 is user-friendly: the on-screen menus are logical, with plenty of scope to make finer adjustments to the picture – the small remote with a piercing blue backlight is handy to use in a dark room. There’s plenty to love about the HD25: it’s an easygoing and pleasant watch with plenty of features for its affordable £800. Yes, it could do with a touch more insight, but it’s an enjoyable projector nonetheless.